1/3 Body size compared to our previous model. Addition of Gradient Module - Gradient function is added to the LC-91 NEXT series with high reliability. The LC-91xxG system is the same as the LC-91xxII system with and addition of gradient capability. Quaternary solvent mixing - It allows blending of 4 different solvents. 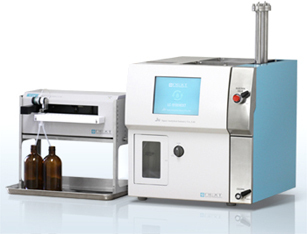 Combining gradient separation follow by isocratic recycling expands the application range for purifying compounds with wide polarity range. Auto rerun function - Stores the previous operation in memory and repeat, resulting in time saving and scaling up the quantity of collection with subsequent run with the same sample. Auto cleanup function - Keeps the flow channels clean automatically. Solvent changeover when changing columns is also made much easier. Non-diffusion function (patent) - During extended recycling period, the recycled sample in the flow line may diffuse back into the solvent with the danger of contaminating the solvent reservoir. The NEXT series has non-diffusion device (patent) that prevents the sample from running back into the solvent line and damaging your columns and detectors with back pressure. Injection overlap function - Enables to make second and subsequent injections without having to wait for complete previous operation. Touch panel screen interface - 8.4 inch size touch panel screen is installed. Operations can be done by simply touching the buttons on the screen from start to collect. Improved layout - Manual injector is mounted outside of the body. Maintenance such as seal exchange becomes greatly easy. The pump and the detectors are also easily taken out by opening the front panel. Other features - Besides the recycle function is equipped, other various functions are equipped for your convenience, such as repeat injector, auto cycle function and rerun function. Two different types of detectors small enough to fit into NEXT series body have been developed. They can be installed together and perform detection simultaneously. UV Detector - As preparative dedicated detector, it has developed its stability and sensitivity can detect most organic compounds.